It’s not difficult to find La Frontera taco truck. It’s big, it’s white and people file in line to place their order. Remember, this is all just off the street. La Frontera is parked in a parking lot where there’s a water mill and an ice dispenser. At first you might not be so sure if you’ve made it to the right place. The only vehicle that has a secure parking spot is the taco truck, so you’ll pull into an old parking lot with a few potholes. Once I secured a parking spot I made my way to the window. To my surprise, there were many people eating their midday meal at the tables underneath a blue tarp. About three tables make up the seating of La Frontera. I’d made my visit during the earlier part of lunch so I wasn’t expecting too many people. Despite the amount of customers, it didn’t take too long to place my order. The menu isn’t super extensive, but it has a nice variety. 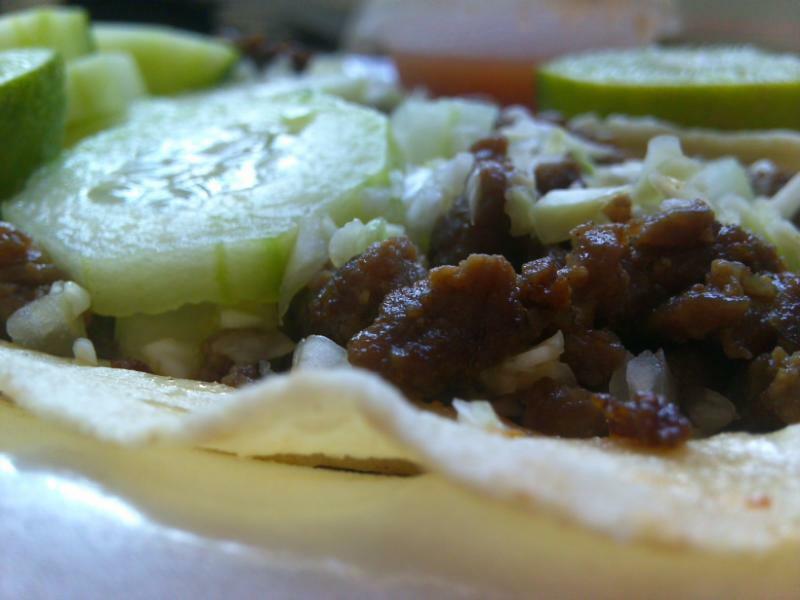 It has several types of tacos, burritos and tostadas. 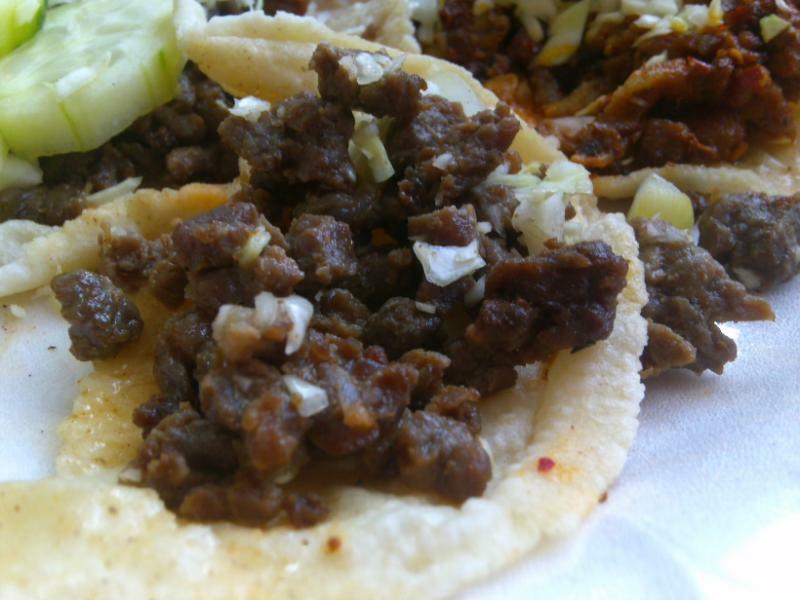 The tacos cost $1.25 each with the exception of the tripitas(fried small intestines) tacos which were more expensive. I walked up the window and prepared to give my order in English. While there was a range of clientele eating, it seems like Spanish dominates the atmosphere. -Dos de asada y uno al pastor, por favor(two asada tacos and one al pastor, please). -Cebolla y lechuga. (Onions and lettuce). It took less than five minutes toeceive my food. Three people(one at the register and two at the food- all on board the truck) seems to speed up the process. 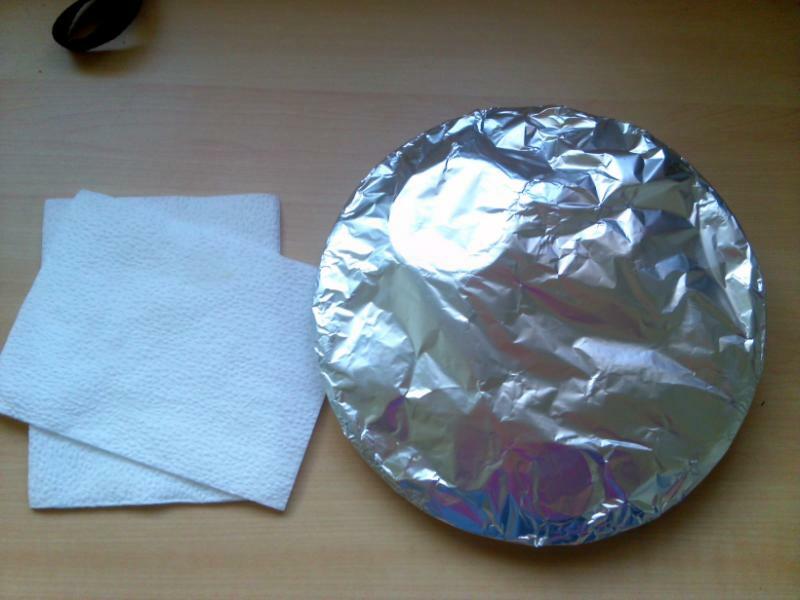 My tacos came on a simple Styrofoam plate covered with aluminum foil. The smell wafted through the foil that it was almost impossible to patiently take pictures. Since I’d asked for todo, my tacos came with onions and lettuce. I also ordered an al pastor(Shepard’s style)taco so I thought that the cucumbers were for those, but they weren’t placed with the al pastor tacos. Moments later I bit into the first taco. Yum. Filling: As you can see, there’s a decent amount of meat that comes with each taco. The meat tasted very good except for a few pieces that might have been a little overdone. Also, the meat looked a little greasy but it did not deter from the taco. There weren’t too many onions on top and the amount of lettuce was good as well. Tortilla: The tortilla was soft and easily chewed. The price justifies for the size, but it was a little small. It was warmed to perfection and didn’t taste like the mass produced tortillas found in the local grocery aisle. Despite the good amount of filling, the tortilla did not fall apart when picked up. 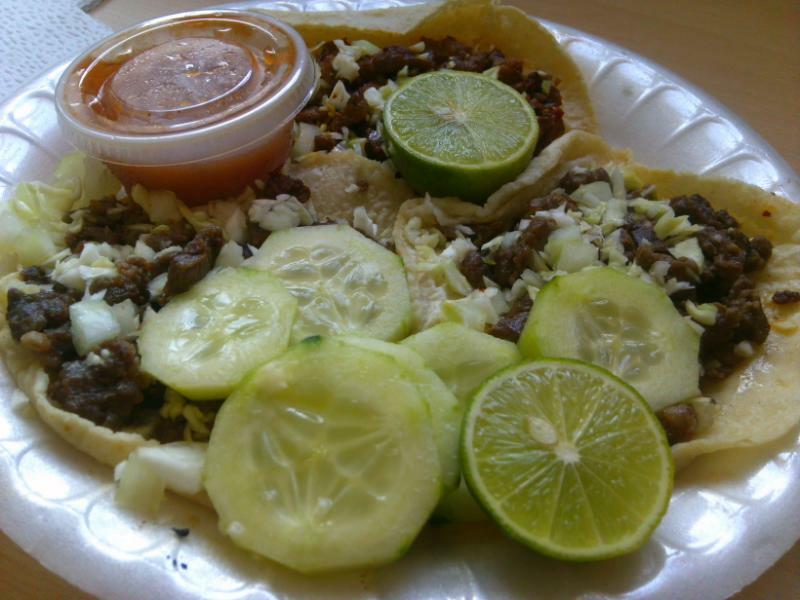 Presentation: Eating off a Styrofoam plate may not be too enticing, but the tacos looked very well put together. They weren’t falling apart and the smell added to the presentation. The smell wasn’t overpowering, and it makes you want to take a bite. The al pastor tacos were good too. The tortilla was the same kind as the one with the carne asada tacos. The meat had a nice flavor and it was a little spicy. I did not see a spit, so they were probably cooked on a sort of grill. A slice of pineapple would have skyrocketed the taste and experience of the al pastor tacos. 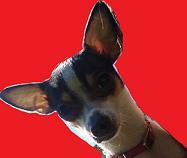 I give La Frontera taco truck two and a half Bellas. It almost hit the maximum of three Bellas, but they’re not perfection. The meat was a little overcooked, so biting to some crunchier tacos and having to chew those a little more wasn’t the best experience. However, make sure to stop at La Frontera for some delicious and cheap tacos. I am glad to see that you have found righteous tacos! Reading about Caramba the other day made me sad. More like, Carajo.